What the heck is this all about? That's about what I thought when I first saw Injinji's "ToeSocks"—socks with individually-fitted toes for your...toes. Injinji makes the intriguing point that traditional tube socks are like mittens, forcing your toes to act as one unit, rather than individually as nature so clearly intended. But do Injinji socks offer a real performance advantage—or just a quirky-looking sock? Because of the way they separate the toes, ToeSocks are said to be cooler. They are also said to reduce blistering between your toes because, obviously, while wearing toesocks, your toes will no longer rub against each other. It was this anti-blister pitch that convinced me to give them a try. My verdict: I'm going to agree. 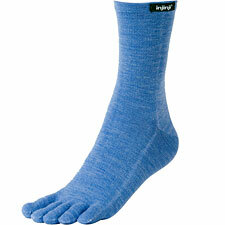 For those plagued with blisters on the toes, Injinji socks may offer improvement. That said, I would rate Injinji's standard Outdoor Crew, which does not employ paneling or padding, as a less effective anti-blister sock overall than, say Smartwool's excellent PhD-series socks. The Outdoor Crew is made of a 70% Merino 25% synthetic (Nylon and Lycra) blend. The Merino is processed to remove any shred of itchiness. Trying ToeSocks on, you'll likely first notice that it isn't easy to get them on. Toes must be helped into each little toe pocket, a process that inarguably takes longer than just slipping your feet into regular socks. That's not likely to be an issue for hiking, but it does reduce the appeal of wearing toesocks every day. In terms of comfort, I noticed the extra fabric between my toes right away. It definitely has an unnatural 'feel' to it. Injinji says you get used to the sensation over time. That's probably true, especially if you wear your ToeSocks regularly. While hiking, the extra fabric does create a slightly wider spread of your toes. This could cause issues in shoes with narrow toe boxes, so be aware of that possibility. I liked the quirkiness of the Injinji sock. They have a look that is unique, to say the least. My brain kept insisting that I'd somehow grown hands in place of my feet. If nothing else, wearing these does make a strong statement of individuality. And I would be remiss if I did not mention the one aspect in which toesocks are pure genius: pairing them with flip-flops. If you love to wear sandals with socks, as I frequently do, toesocks offer the perfect marriage. No longer will you be forced to jam your sandal's toe strap down into your socks. Whether or not that's worth making the switch to toesocks is a question only you can answer. Overall I find that there are enough possible advantages to warrant trying Injinji's socks—but I suspect I'll be doing most of my hiking in my regular socks.